HP 612 x2 12.5" Tablet G1 with HP Pro x2 612 Travel Keyboard. Storage -128GB SSD. We have more than 100 units. Windows 10 pro preinstalled ready to use out the box. Hi This auction is for a Dell Venue Pro 11. Used condition but well looked after. Comes with AC adapter and Keyboard/expansion battery case. Great tablet. CPU: intel core M-5Y10c @ 0.80GHz 998MHz RAM: 4GB SSD: 128GB WiFi and 4G Windows 8.1 Pro OS has been reset to factory defaults. Ready to go. UK Postage: £7 insured and tracked. Dell Venue 11 Pro 7140 4G Unlocked Slim Keyboard (RRP £100). Specification in picture, 128GB, 4GB Ram. Windows 10 Education (lightweight). IOS 10 Compatible. All iPad's are fully tested and in perfect working order. Need an Apple box for a gift etc?. Link below. FREE 12 Month Warranty. 12 Month Warranty. Tablet only. Briefly function tested. Power tested and touch screen works and goes to settings OK. Item has been erased using BLANCCO software and reset to factory settings. WHAT IS A FACTORY RESET AND HAS ONE BEEN DONE ON THIS ITEM?. Win 10 64 bit. Few scuffs on side of keyboard (pictured.). Letter L key is a little loose but all keys work. Few surface marks but screen is in nice condition. No box or cables but will include a charging cable. Just the tablet in the box and the keyboard are supplied. We will always help you to have a 100% positive happy buying experience. Tablet is ready to set up as your own, no account lock. Tablet is in great condition physically, no cracks or marks on screen. Dell Venue 11 Pro 7140 128GB, Faulty Battery. Works completely fine just needs a new battery Condition is Used. Dispatched with Royal Mail 1st Class. 1 x Dell Venue Pro 7140 tablet. WIFI, AC Adapter Genuine Windows 10 Pre loaded. USB3.0 Headphone and microphone combo jack 1 x micro HDMI. 1 x Charging Lead. 1 x Power Lead. Dell Venue 11 Pro 5130 128GB, Wi-Fi, 10.8in - Black. Condition is Manufacturer refurbished. Dispatched with Royal Mail 2nd Class. 128GB SSD drive. Tablet is in excellent condition with carbon fibre vinyl installed to hide the ex-corporate logo which has been rubbed off. Vinyl adds a nice finish to the tablet and looks really good as seen in pictures. FAST DISPATCH , TRUSTED SELLER, AMAZING PRICE !!! All iPad's are fully tested and in perfect working order. Need an Apple box for a gift etc?. Link below. FREE 12 Month Warranty. Overall I'd Grade A-B (Good Condition). 12 Month Warranty. 128GB Wi-Fi 4G/3G (Cellular)- Unlocked. iPad 4th Gen- 128GB- Wi-Fi Cellular. Apple iPad 4th Generation. Our solutions enable end users to work with the tools they know and love without interruption or compromised performance, and only Dell gives IT. You can enjoy the flexibility of a 2-in-1 with the added option of a desktop experience. Apple iPad Pro 12.9in 128gb WiFi and cellular, Grey. Unlocked (For 4G data sims if required). All iPad's are fully tested and in perfect working order. Need an Apple box for a gift etc?. Link below. IPad 4th Gen- 128GB- Wi-Fi Cellular. Colour Black. Apple iPad 4th generation Colour Black-. An excellent working order and fully functional iPad. Signs of use couple of scratches on the top corner of screen (only visible to look very closely on the blank screen). Dell Venue 11 Pro 7140 128GB, Wi-Fi 4G (Unlocked), 10.8in - Black. Condition is Used. Dispatched with Royal Mail 1st Class. 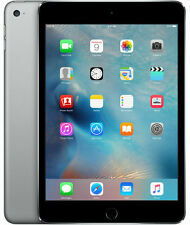 IPad 4- 128GB- Wi-Fi- Black. The screen glass display totally mark or scratch free,mint condition. Key Feature -. Back casing has very minor surface marking,and a very tiny dent on the edge. Earphone/ Stylus pen/ New leather protective case (Choice to pick one). Dell Venue 11 Pro i5 256gb bllack. Comes with keyboard, pen and charger. Apple iPad mini 4 128GB, Wi-Fi 7.9in iOS 12. All iPad's are fully tested and in perfect working order. Mint condition. May have 1-2 faint signs of use. The Lenovo Tab 4 8 is the first tablet to hide many tablets in one. Internal storage capacity 16GB. 1.4GHz Qualcomm Snapdragon apq8017 quad core processor. Cinema-worthy sound - Make the most of your cinema therapy because Tab 4 8 contains two high-quality speakers that will really make your TV shows and movies pop. DELL VENUE 11 Pro 7140 Tablet. Card Reader - MicroSD up to 128GB. Full HD 1080P 10.8" Touchscreen. Windows 10 Pro. USB 3.0/3.1. Immaculate condition - see pictures for details! 128GB Storage. Storage Capacity 128GB. Included in-box the island-style keyboard has a POGO and magnetic connection – simply clip it on and go. Samsung Galaxy Book. Keyboard Cover. The new in-box S Pen opens up a world of possibilities. Slim and light design. Full-Size Keyboard and Touchpad. Optimised Viewing Experience. sAMOLED Touch Display. Tablet może posiadać drobne ryski. Ten przedmiot został odnowiony. Oznacza to, że został przetestowany i jest w pełni sprawny. Gradacja B. B - The product has traces of use, there may be scratches on both the display and the housing, minor abrasions, slight deformation / bending of the plastic (e.g. at the micro-usb input). 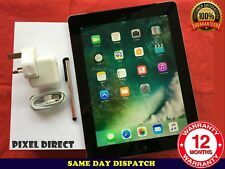 Geniune Apple iPad 5th Generation Air 128GB WiFi + 4G Black *VGWC! * + Warranty!